I know…..it’s Christmas but childhood cancer doesn’t take a holiday. Today there are children who were just told they have cancer. There are those in hospitals getting chemo, radiation and bone marrow transplants. Some are learning what terminal means having been told they have run out of options or there are no treatments. A few children are breathing their last as their parents hang on to every precious moment with them. And, yes, many families are learning what the holidays are like without their child, sibling, grandchild, nephew or niece. For the approximately 224* families who are discovering for the first time what Christmas is like without their child this year cancer didn’t give them a break. Add those families to the 224 who are enduring their second Christmas in mourning, 224 going through their third and on and on it goes. Childhood cancer doesn’t go on vacation so neither do I. I will continue to do what I can to raise awareness, to attempt to highlight the importance of this issue and hopefully help make childhood cancer research a priority in 2014. I hope you will join me. If we don’t…. 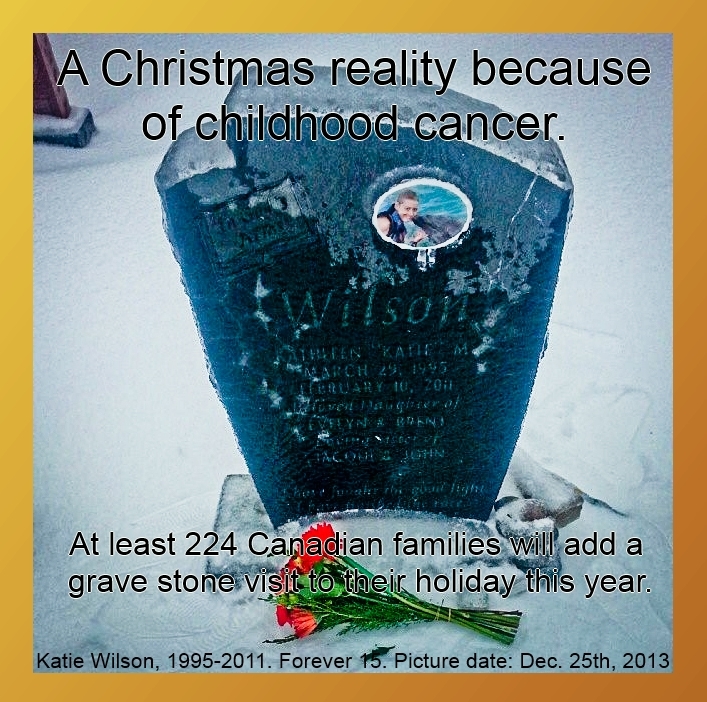 nothing will change and next Christmas 224 more families will visiting a grave stone. *Statistic taken from the Public Health Agency of Canada website. It is the sum of the number of deaths listed for children under 15 and adolescents. Deaths are only counted up to 5 year post cancer diagnosis and only includes those who have died from cancer. It does not include children who have died from the side effects of treatment. This entry was posted in awareness and tagged cancer, chemo, childhood cancer, childhood cancer awareness, hospital, pediatric cancer by GoldenCancerMom. Bookmark the permalink.